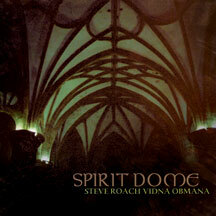 Steve Roach / Vidna Obmana’s 2002 CD InnerZone served as the doorway to the surreal environment explored on Spirit Dome. Recorded in one continuous 74 minute session, this is a dark sanctuary of pure texture and beautiful, if not at times foreboding, dissonance pulled along with pulsing beats, subtle loops and dense soundworlds. The single piece, “Spirit Dome,” captures a chilling gothic ambience that offers the exploration of remote psychological states of awareness. This is achieved by way of extensive live processing of instruments including fujara (overtone flute), guitar, and the seemingly bottomless wellspring of electro-acoustic sounds found only in the soundscapes of the duo. When listening to the recording unfold, one has to keep remembering that this unscripted spontaneous creation was a live session recorded directly to the stereo master, just as you are hearing it. No post production edits or overdubs were performed. Past discs from the duo include 1995’s Well Of Souls, 1997’s Cavern Of Sirens and 2002’s InnerZone; add their live concerts together in Europe and the US and we are brought to the enveloping world of Spirit Dome.